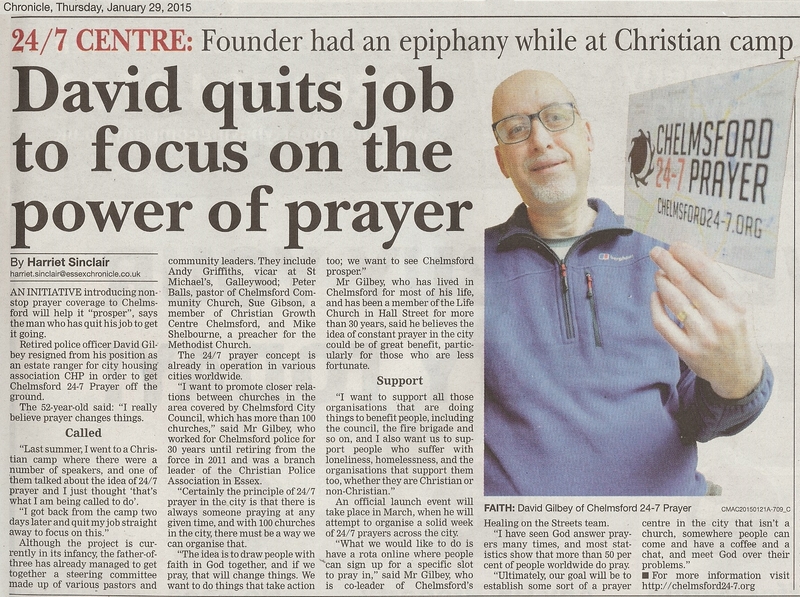 We are really pleased that our main local newspaper, the Essex Chronicle, has this week published an article about Chelmsford 24-7 Prayer. This has been extremely well written and accurately reflects Chelmsford 24-7’s aims to bless the people of our City and wider District. (Click here to enlarge the below image in your browser. you can also read an online version by clicking here). Off the back of this article, I also received today, a phone call from the producer of the BBC Essex (radio) Sunday Morning program with Peter Holmes. I have been asked to go along on Sunday 15th February to be interviewed. This will be between 8am and 8.30am and will include me reviewing he newspapers too! Otherwise, over this last week, strong progress to make church leaders aware of 24-7 Prayer has been continuing. I’ve contacted and also met with several people. Bishop Steven, the Bishop of Chelmsford has for one expressed his personal support and interest for what we are looking to do. Next Wednesday (4th February), is the first meeting of our new Team, who will be looking even further into the way forward. One of the first matters we will be talking about is our proposed City and District Wide 24-7 “Week of Prayer”, 22 to 28 March 2015. I hope that full details of this will be released in the next couple of weeks and that churches and individuals will quickly be inspired to sign up. Please keep praying and telling others. At the last count I have seventy-four people on this mailing list, nearly one-hundred on Twitter and eighty-seven on Facebook – although some will be on all three (I am!). However, Social Media and Internet will not alone make this work. But the power of prayer will – your prayers. I know many of you are praying hard for this and are really excited as to how God is already making it all happen. Check out the Please Pray page which I have just updated. Previous PostThe ripple effectNext PostWeek of Prayer – bookings are open!